Naked bodies are projected with hypnotizing designs and patterns in French artist Dani Olivier‘s striking new photography series, Corps en Ligne, which translates roughly to Body of Lines. Eight years ago, in search of a new artistic direction, Olivier stumbled upon the unique potential for using light projection to create beautiful new representations of the female body. He started playing with lines and as he continued this process, began adding color and morphing the shapes and contours of his projections. Olivier tries to a find an uninterrupted progression in the union of two images: the model’s silhouette and the complex light pattern projected on them. “Harmony is usually made when the design that is projected changes over the curves and outline of the body, and makes a completely different formation from what was originally displayed,” he says. He began this process with photos and has recently started working on short videos, mostly in slow motion. “When I’m in the process of taking photos, the girls are usually moving except in certain positions when I am looking for something very specific,” he says. “Often I let them create the movement that they want. I often work with dancers, and with dancers and you can’t usually stop them once they start to pose.” Olivier follows these movements in his photographs to capture a unique footprint. He equates this effect to the thread of of light you see behind a shooting star. Olivier has exhibited his work in Los Angeles, Moscow, and Kiev. 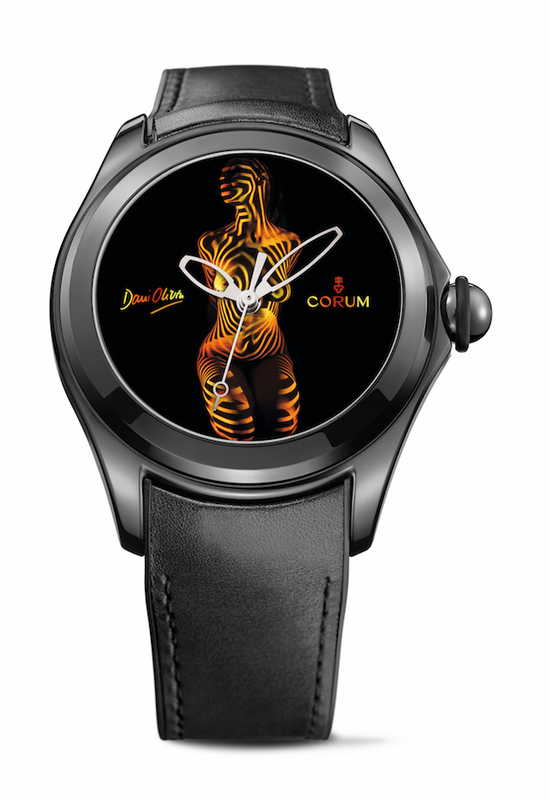 One of his more recent exhibitions was in Paris at the Foto Fever Art Fair, where he was approached by Swiss watch company Corum and asked to design a watch decorated with his projections. The Corum representatives were attracted to the idea of developing technology dedicated to beauty. Check out more of Olivier’s work on his Instagram, here. And you can stay up to date on any upcoming projects at this website here.